Bay Shore Steel Works (BSSW) has worked as a trusted partner, providing high-quality fabrication, machining and finishing services to a wide variety of customers in many industries. Including the most demanding customer in the world: the United States military. Capabilities Specializing in working with armor plate steel, we are capable of handling the materials you need in a variety of industries. From housings for industrial air cleaning equipment … to the armor plate that protects the crew of an M-1 tank … from fabricating, welding, machining, component assembly and CARC finishing … Bay Shore Steel Works offers you the strength to survive. Bay Shore Steel Works cutting processes allow us to cut parts to the highest tolerances, without affecting the properties of the metal. It’s perfect for large parts that require precise dimensions, or for hardened metals like armor plate that could be softened or deformed by other cutting methods. We’re one of the few Michigan facilities offering Mil Spec certified chemical agent resistant coating (CARC) finishing for military applications. We do it in a 4,500-square-foot paint line complete with curing oven. Our eight CNC machining centers can provide nearly any turning, milling or boring operation in parts up to 46″ x 96″. High-quality parts start with high-quality engineering. 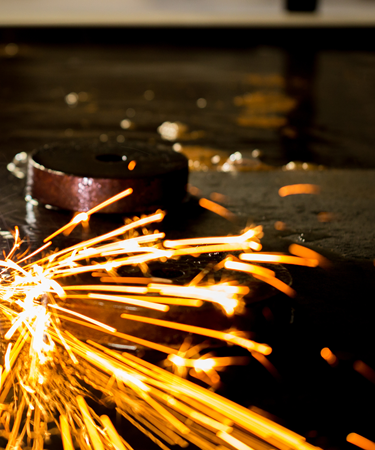 Bay Shore Steel Works can offer the assistance you need at any stage of product development. We can cut and machine directly from your CAD files … or we can assist you in the process engineering and prototyping stages to make sure every detail works perfectly. Our engineers use state-of-the-art 3D solid modeling software. Like everyone else in our organization, they adhere to the rigid quality control principles required by the U.S. military.